Picked up our first 5 chicks from a friend. They are half RIR and half Australorp and are 3 weeks old. Hens or Roosters… we just don’t know. Here is a picture of the parent chicks and Alana with the chicks (she’s so happy). After a lot of debate and checking we decided to let go of 4 of our 5 chicks. The 4 that left just seemed to really look like roosters and so we decided not to risk it. It was a sad goodbye, but a very nice man came to pick up our “roos”. We were a little hesitant not knowing if they were really roos or not, especially since they were so very friendly and nice. In the end we decided we’d be better off with more variety of breeds and with ones we were sure were hens. After a few weeks with just one chick we finally found her some new friends! Here are the highlights. LenLeo sent 3 beautiful adult roos down to eggchel (1 for eggchel, 2 for wolfey). eggchel brought those birds up with 4 chicks of her own along (all 4 for wolfey) with a pretty black silkie / cochin mix named Elvis for us! Oh, she also brought us about 3 dozen duck and chicken eggs of various sizes and colors. We introduced Elvis to our young australorp RIR mix and after a bit of pecking they became friends. Talked to two neighbors who each wanted us to pick up some chickens for them. Drove out to wolfey’s, chatted, looked at some birds, chatted, picked out 10 birds that we thought looked good, chatted, learned how to clip wings, and then chatted! Drove home and called the neighbors. Second neighbor came by and picked up 3 more hens. After a lot of discussion between the wife and I we decided to let Elvis go to the second neighbor’s house. They have older kids that would appreciate Elvis more than we would right now. 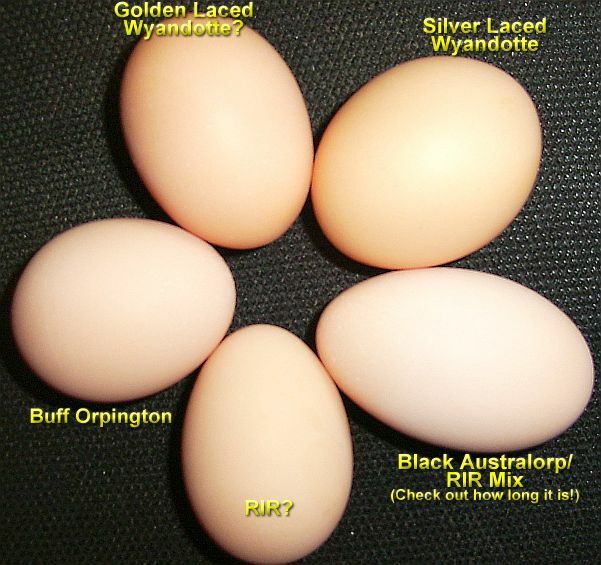 Mix… maybe a Golden Laced Wyandotte and ?? Mix? maybe a Silver Laced Wyandotte and ?? The first two seem neck in neck for head hen while buff and blackie are the youngest and always get pushed around. We’ve tried to get these hens to start getting used to us by throwing food to them and dropping it closer and closer to us. I’m glad to report that today I got all 5 hens to pick a piece of bread from my hand. I couldn’t have done it without blackie. She’s already so used to us that she has no problems eating out of our hands. She quickly ran over and started munching away and was really enjoying the fact that the other 4 hens were still to scared to approach, so no fighting over her food. Well, that was until the other 4 hens wanted to know what was going on. RIR was the first to be brave and came over to start pecking away at the food in my hand. The others, while not as bold as Red did come over and take a quick nibble and ran off. It has some little reddish brown speckles and splotches on it, but I figure this is normal. Is it blood, or something else? I was waking up and heard the “song” that I was told a chicken would sing after laying an egg. I went outside expecting to see an egg, but instead I found TWO!! One was pretty warm (must have been very recent) and the other was pretty cold… maybe even from last night / yesterday? I wish I knew who laid them. I know it was two chickens, but don’t know if it was the RIR again, or the two others. I’m like an egg factory over here. I went out for the daily egg check and to my surprise I found 4 eggs today. 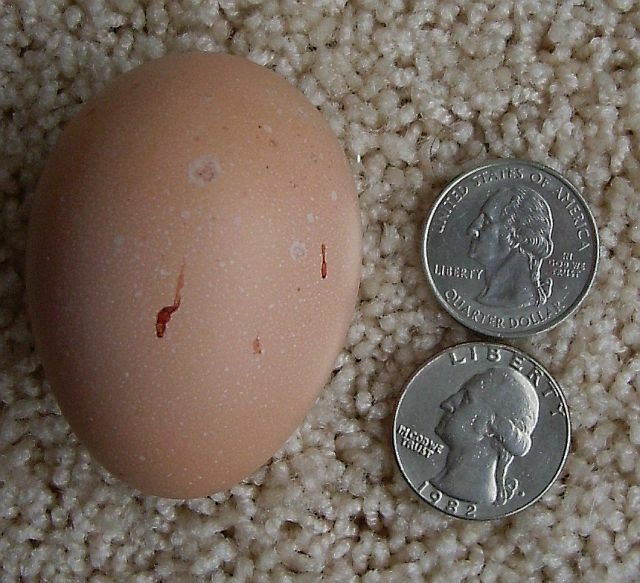 The wife and I noticed that the Buff’s comb and waddle were getting a bit more red, and she’s just the right age to start laying. Here’s a picture, can you guess which one is hers? And remember to visit http://www.BackYardChickens.com! just like to say you have some nice chickens and lovely duck. Those chickens sure look happy and healthy! Nice job! Found your blog while searching ‘Buff Orpingtons’ since I’m planning on trying my hand at raising chickens…great info and very helpful! Thanks! Thanks for all the great comments everyone! It sure has been fun raising all these hens and now that we’ve started getting eggs again (winter was pretty eggless for us) we’re even more happy! 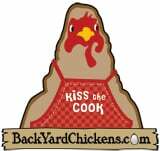 Remember to visit my site http://www.BackYardChickens.com/forum for more fun! THANKS for sharing your egg pictures! I am dying to know WHO is laying which eggs. We are averaging only 1.5 a day. But, I hear some very happy singing hens out there today, so I am hoping for more this week. 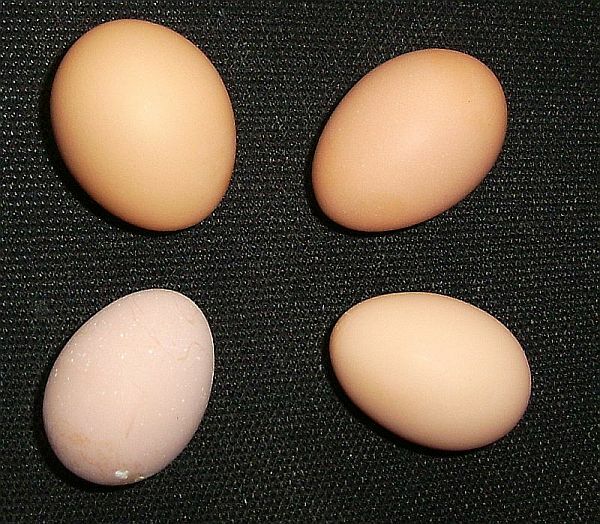 Have yours layed any speckled eggs??? We have some that look speckled..
Great story. I have 9 hens but have no clue what egg comes from who. Latest 3 are Silver americana, Black Astrolope and a calico meran. Good luck on your eggs. Hi, I found you site while looking for ideas for our chicken coop. This is our first year, we have 5 chicks inside and need to get our coop finished. WE have ideas, but the big question is what to do for the floor. 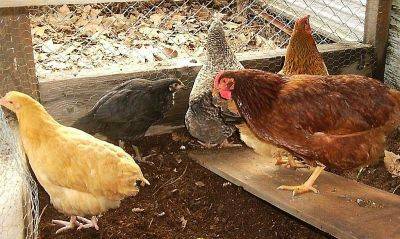 I read through some of your discussion on the chicken coop forum. Did you go with wire floor or something different? That is our big hold up. We are considering wire flooring with a removable try for the ‘fertilizer’ under it for easy cleaning. Just looking for thoughts from others. Thanks ahead for your input. Oh My Gosh! These chickens are soooo cute! They are adorable! I have 2 barred rock hens, 2 Rhode Island red hens, 2 dark cornish hens, a Silver Duckwing hen (she is soooo tiny), 2 white silkes (one hen one roo), 3 Buff Orpington hens, and an Silver Old English Rooster. I hope to have 3 hatching eggs tomorrow! They are the sons/daughters of the dark cornish and Old English! It’s going to be interesting of what they are going to look like!!!! !